Grout Coloring Plano? If you are looking for a reliable grout coloring Plano solution then you have come to the right place. Unattractive grout lines have been noticed is several Plano homes. Filled with unwanted stains. In addition, there are many people who are sick and tired of the same old color of their grout. This is the reason why they are looking for a grout coloring Plano company that can help them. The company Ultra Clean Floor Care has been involved in many grout coloring Plano projects. With the help of our team of professionals, we have managed to meet or even exceed the expectations of homeowners and business owners. Thanks to our high-quality service, specially created and developed to make your old, boring and dirty grout livelier. You can rest assured that this area will look more attractive. As a matter of fact, when our professionals get the job done, you will get tiles that look fully revitalized and rejuvenated. We understand your feeling of embarrassment about your old grout (even though you clean it regularly). Homeowners are always stoked when Ultra Clean is finished renewing their grout. Have a Plano Project Needing Grout Coloring? So, what can you expect if you get involved in a grout coloring Plano project like this? First and foremost, your grout will look as good as new. 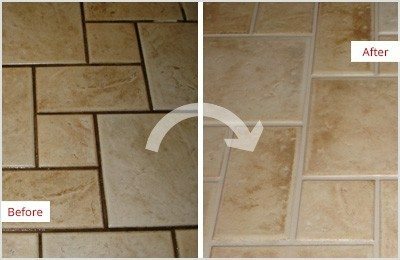 There is no need to invest a small fortune to get rid of the old grout and replace it with a new one. Replacing tiles and re-grouting is an option only in cases when tiles are damaged due to different reasons. This is a costly activity suitable only when there are no other options. Grout coloring is an excellent option for those who want to get an even color all over the floor. This is a huge problem in some homes especially when the frequency of use is different in different parts. The company, Ultra Clean Floor Care is here to provide a natural and professional finish to your grout. 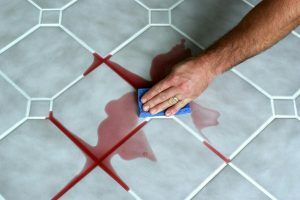 It doesn’t really matter whether the grout can’t be cleaned due to spilled stuff like Kool-Aid, food, grease and lack of a sealer. We are here to make the grout attractive again. It is good to mention that in some cases, improper maintenance and installation mixing of grout are the reasons why grout loses or changes its natural color. After the process of coloring, owners no longer need to scrub their floors and the entire process of maintenance is much easier. Ultra Clean Floor Care offers dozens of different colors. we can also custom mix colors in order to find the perfect match for your grout. Our grout coloring service is ideal for bathrooms, kitchens, laundries, showers and other areas. This is a process that doesn’t require much time. So, in case you want to start a grout coloring Plano project, you can always count on Ultra Clean Floor Care. We are here to make your tiles look as good as new!